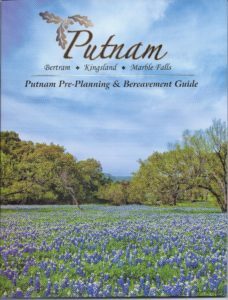 Cremation Advocates by Putnam is pleased to announce the release of the Putnam Preplanning and Bereavement Guide. In addition to providing information about Putnam Funeral Home and Crematory, Cremation Advocates by Putnam, Bertram Funeral Home, and our staff, it provides insight into creating meaningful ceremonies, pre-planning/planning ahead, where to begin when making funeral arrangements, what to do first, legal issues, probate, grief, helping a friend or neighbor cope with loss, and bereavement and support services. It includes a planning questionnaire and a list and location of key documents. It also discusses the value of visitation, the difference between burial and cremation, incorporating military honors into a funeral, and how to custom design a Celebration of Life. This magazine is available, for free, from any Putnam location, area chambers of commerce and visitor centers, and other area businesses. You can peruse the book on-line at the end of this post and we will be happy to mail you copies should you prefer. We are providing this magazine as a community service, because we care, because we are guides and understand the need to have a resource that lays out what you need to know in black and white. Should you have any questions, or would like a magazine, please do not hesitate to contact us at 830-798-8413 or at staff@cremationadvocates.net and we will be happy to assist you. Sincerely – the Putnam Team – Jessamyn Putnam, Chris Putnam, Brittany Carrington, Jim Simmons, Eli Heatley, and Anubis and Anput. Serving Kingsland, Sunrise Beach, Horseshoe Bay, Cottonwood Shores, Meadowlakes, Marble Falls, Round Mountain, Spicewood, Bee Caves, Burnet, Bertram, Liberty Hill, Oatmeal, Buchanan Dam, Tow, Llano, Granite Shoals, Highland Haven, and beyond.